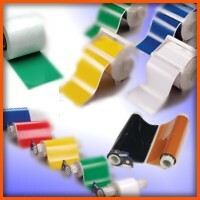 The most commonly used term for GlobalMark thermal transfer supplies is "GlobalMark Ribbon". GlobalMark ribbon is formulated for use only in the GlobalMark printer, and only with GlobalMark vinyl. GlobalMark ribbons come in an easy to load cartridge, and are available in multiple colors. Some ribbons come in a panel format, which means that a single ribbon can have segments of different colors, allowing for multi-color prints. The hardware in the GlobalMark printer and in the GlobalMark ribbon cartridges allow the printer to operate only when loaded with a Brady or compatible cartridge. These are some sample catalog numbers for commonly used Brady GlobalMark ribbons. These are just a few examples of the ribbon supplies that are available for the Brady GlobalMark label printer. The MiniMark, GlobalMark and PowerMark names are registered trademarks of Brady Corporation and are used herein to describe actual Brady products. Industrial Safety Solutions sells original Brady products, but is not a Brady authorized distributor and is not affiliated with, endorsed by, or sponsored by Brady.